The Master of Science in Aerospace Engineering programme is awarded by Technische Universität München (Technical University of Munich, TUM). The programme is conducted in Singapore and it serves to provide graduates with an in-depth knowledge in the field of aerospace engineering, focusing in the areas of aeronautical and space design and research. The 2-year full-time programme is taught by academia from TUM, who have extensive experience in the latest trends in research and education as well as in global industrial product development and management. The non-technical subjects are taught by experts from the industry, from Asia and Europe alike. Lectures will be held at TUM Asia‘s campus in Singapore. Students who have passed all examinations and satisfied the criteria to graduate will be awarded a Masters degree from TUM. For information on programme details, duration & admission requirements, kindly download the brochure below. Please take note that these brochures are for personal reference only, and should not be used for other purposes. All information is accurate to the time of publishing. Updated July 2018. In order to be eligible for the programme, you must have at least a Bachelor Degree** (completed in at least three years, depending on factors such as the rest of your education background) in Aerospace/ Mechanical Engineering or in a closely related discipline with remarkable results. IMPORTANT: Information is subject to changes for the AY1920 intake onwards. The teaching faculty in the programme are predominately from TUM, as well as additional modules taught by industry leaders and other expert academics. All coursework are conducted in English and students will be taught by German and Singaporean lecturers. Student-teacher ratio averages between 20:1 to 40:1. Only live teaching is conducted in all TUM Asia classes. All examinations will be written by the student him/herself, and examination results are released approximately 1-3 months after the examination. The Master of Science in Aerospace Engineering degree is a 2-year full-time programme. Students must complete their coursework, 3-month internship and 6-month of Master Thesis writing to qualify for graduation. In order for a student to graduate from the degree programme, he/she have to complete all 120 ECTS credit with a pass. A student will successfully complete his/her degree course in the n+2 year, n being the year of enrolment and assuming the circumstances that the student will not have any failed modules that he/she is required to retake. For example, if a student is enrolled in August 2019, he/she is likely to complete the course by August 2021, subject to the fulfilment of the graduation criteria. This module provides a comprehensive introduction to the functionality of the software MATLAB / Simulink and explain, for which aerospace engineering problems the tool can be used. Emphasis is on the numerical modelling of technical problems and the engineering interpretation of results. For the dynamic vibration behavior, syntheses will be made with control simulation to show the interaction of several disciplines and to introduce into the field of controlling flexible systems. Students will choose 5 modules. This module focuses on the basics of the calculation and the analysis of the aerodynamic forces acting on aircraft. Students will know the basics of subsonic aerodynamics of airfoils and wings also the theoretical models and experimental methods of fluid mechanics and the aerodynamics. This module covers a multi-disciplinary range of topics in the field of aircraft operation with focus on commercial air transport. Starting with a review of the history of civil aviation, the module presents important players, operating processes and procedures, and boundary conditions of the air transport system & additionally portrays the future perspectives of new technologies and their potential impact on aircraft operation. This module will provide a basic overview of the different systems and processes applied in aviation. A general understanding of civil & military aviation will be given to enable basic differentiation of different aircraft configurational layouts. Particularly, the interaction between the different system elements, their relevant requirements and their impact on configuration level will be fundamentally outlined. In this module, topics in flight system dynamics and flight control will be covered. Students will be able to understand relations between aircraft performance and flight control. From this course, students will be able to apply aircraft performance calculations that are required in the preliminary design of aircraft and are able to design basic flight controllers for stabilization and improvement of flight properties. The module provides basic knowledge about aerospace propulsion systems. The basic governing thermodynamic & aerodynamic equations used in the engine design process, Aero engine and gas turbine cycle and component performance as well as their interaction will be covered. This module covers the essentials of lightweight structures & materials, which provide a basis for structural development including proper material selection. A general view on the basics in elasticity, structural stability, vibrations and strength including fatigue problems are given. Design, numerical analysis and test methods are introduced. On the materials side, metal lightweight alloys and fiber composites are covered. Students will choose 7 modules. This module conveys complex control concepts for aircraft. In addition, the C*-criterion is derived and modern concepts of adaptive control in aviation are presented. This module covers the various types of turbomachinery applications with particular emphasis on compressors. Starting from the fundamental equations in fluid dynamics, the working principle of turbomachinery are derived. Moreover, main components, characteristics and associated flow phenomena are explained. For compressors, design methods and processes, topics of operability and stability enhancement are covered. This module describes basic aeroelastic phenomena arising from the mutual interaction of elastic, aerodynamic and inertial forces on a structure, with special emphasis on problems related to fixed wing vehicles. Aeroelasticity plays a major role in the design, qualification and certification of flying vehicles, as it contributes to the definition of the flight envelope and affects various performance indicators. This module introduces the approaches for the development process of lightweight and aerospace structures, including design, simulation, optimization and testing aspects. Current structural design concepts for aerospace applications are shown in the context of goals and requirements to be achieved. Possible future developments are addressed and reasons are discussed. This module covers various current design methods & relevant design tools for the applied design of surface aircraft. With the simultaneous introduction to the aircraft design system, students are enabled to design both individual components of the aircraft with regard to the overall aircraft, and define the overall aircraft configuration so that it complies with the current requirements with regard to safety, safety and security economy, comfort, the environment and the performance of flights. This module covers basic phenomenons present in boundary-layers. Physical models and the derivation of the boundary-layer equations from the Navier-Stokes equations are discussed for flat 2-dimensional cases. Temperature, compressible and 3-dimensional boundary-layers are explained. The stability theory explains the laminar-turbulent transition, turbulent boundary-layers and experimental research methods. This module introduces the main properties & design principles of fibre composite materials and calculation methods. Focusing on Carbon fibre polymers, other types of fibres and matrix materials, failure criteria and behaviour under environmental influences, carbon fibre specific fabrication and manufacturing methods, parameter processing, design and material testing steps will be covered. This module introduces the basic operating principle of flight controls. Based on the non-linear equations of motion of airplanes and basic control theory principles, control strategies are derived in order to improve the handling qualities or stability of airplanes. In addition, strategies for the implementation of autopilots are presented. The content extends over different design requirements and their classification, the sizing process, evaluating the flight performance with respect to power consumption, rotor craft limits and mission design. Additionally, the lecture will cover tools for the cost and weight estimation of the designed rotorcraft. This module covers Aviation Safety Principles, Basics in Regulations, Airworthiness Code (CS-27, CS-29), Loads, Stress & Fatigue, Performance Categories, Safety Analysis & Flight Accident Investigation. This module addresses the certification process of avionics and flight control systems in commercial aviation. The focus of this lecture lies in safety analysis methods, taking common approaches of their employment in development projects of safety-critical systems in the industry into account. The course begins with giving a general overview of the development and certification of flight control systems, along with the contents of relevant development standards and recommended practices and the resulting process structure. Based on this, profound knowledge of the process and methods of safety assessment of complex technical systems in aircraft is conveyed. This survey class of astronautical and space engineering topics presents the relevant theoretical background and engineering design methods to find suitable solutions for spaceflight and spaceflight technology. The module will be following the processes and technologies from launch (physics of spaceflight, rockets, propulsion, trajectory, spaceflight environment) to orbit with topics in physics (orbital mechanics and dynamics, interplanetary flight, navigation) and engineering subsystem technologies (power, thermal, communication, sensors, actuators). The topics and processes will be presented with practical applications in mind. Students have to choose 1 module. The primary purpose of the module is to introduce students to the different areas of business administration with the final objective to give them a basic understanding of how to face decision problems in a company. Most importantly, we will analyse long-term investment decisions, how to set-up strategic planning in a company, how to gather timely information about the current situation of a company, and how to set-up the long-term financial structure. This module presents the dynamics of technological development through innovation and the related management issues, the difference between creating a new product (invention) and improving an existing product/idea (innovation), Start-ups and financing of innovation, Innovation-driven economic cycles and Innovation impact on growth and jobs. This course is useful for students who plan to take up careers in manufacturing and service companies or in R&D organizations that make significant use of research and technology to build their portfolio. Marketing strategies are developed for a typical commodity and speciality business. Students will work in teams to develop business cases, make their own business decisions and develop marketing concepts based on provided information of a real case study. After the completion of coursework, all students have to complete a (minimum) two or three month internship with the industry or with an academic institution. It is required for the student to complete an internship related to his or her field of study at TUM Asia. There will be an informative briefing session conducted for all students to equip them with the necessary knowledge regarding internship and thesis guidelines of TUM Asia. 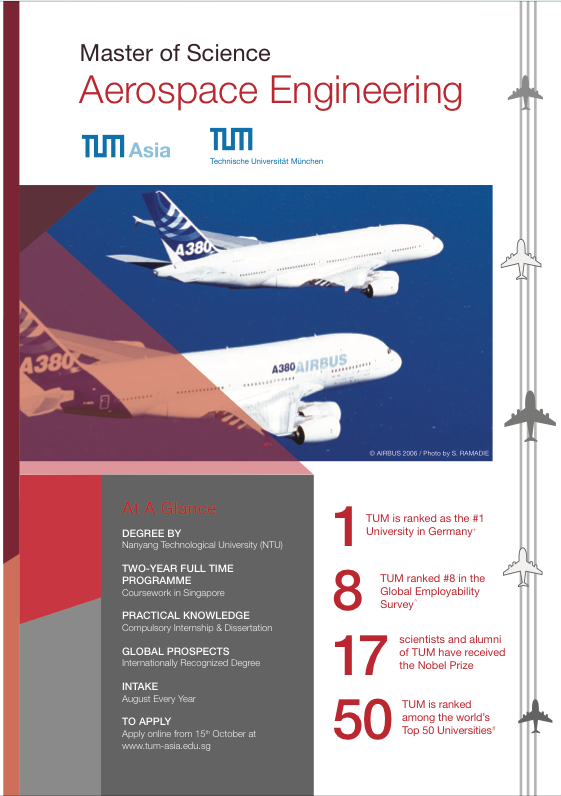 This briefing will be held during the first or second semester of your studies at TUM Asia. The total tuition fees for the Master of Science in Aerospace Engineering programme is S$ 38,520.00* (inclusive of 7% GST).